Healthy Koi are pleased to announce the launch of the Sansai shower filters. The Sansai shower filters are an attractive and economic way to provide extra biological filtration and aeration to your pond. Made from UV resistant high density polyethylene, these filters are less prone to heat loss than metal equivalents. They are available as a small or large model, for 3,000 or 6,000 gallon ponds respectively. Both models have a 50mm inlet and a choice of a weir or 110mm pipe exit. The choice of exit allows you to mount the shower either, beside the pond, with the weir exit, or in your filter area with the 110mm piped exit. The showers are fed by a pump, preferably after a pre-filter or existing filtration. 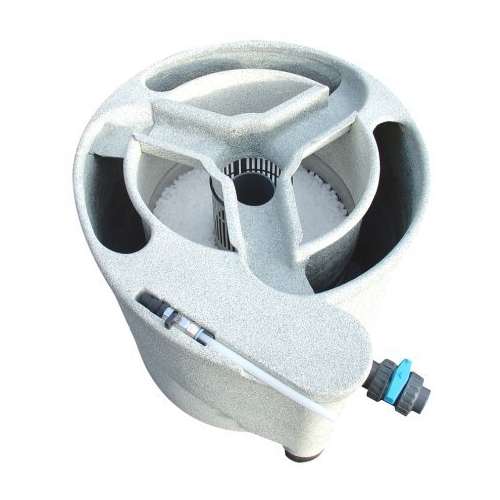 The water passes through spray bars at the top of the unit, which distributes the water evenly over the filter media. As the water passes through the unit, it will move through the layers of media, splashing and aerating as it descends. At the same time, oxygen is drawn through numerous vent holes, which is used by the bacteria and to aerate the water. After its journey through the unit, the water arrives at the bottom collector unit where it is returned to the pond via a 110mm pipe or weir. Although these units are available from £395 (Small) and £595 (Large) without media, we would recommend buying the unit with the filter media. Healthy Koi offer the Sansai Small with media for £455 and the Sansai Large with media for £715. The Healthy Koi packages use BioPore filter media, which is an excellent and effective ceramic media. BioPore is extremely porous and lightweight allowing for a larger colony of bacteria and for more biological filtration, than other medias. For an easy and attractive way to improve your water quality speak to Healthy Koi on 01243 572762 about the range of Sansai shower filters, or go to www.healthykoi.co.uk. Healthy Koi are pleased to announce that they will again be attending the FBAS Festival of Fishkeeping this year. Said by many to be one of the UK’s top aquatic shows displaying coldwater and tropical fish from all over the world, it is the Federation of Aquatic Societies showpiece for the year. In addition to extensive coldwater and tropical fish displays, there will be a Koi festival taking place and attended by the South East, Middlesex & Surrey Borders, Worthing & District and the South Hants Koi Clubs. The Show will be open to the public from 10.00am to 5.00pm on Saturday and Sunday 9th & 10th October, 2010. The event will be held at the Mill Rythe Holiday Village on Hayling Island, Hampshire and the route will be signposted from the A27 Havant junction southwards. In addition to our water quality management and bio- security roles, we will again be having our trade stand and our enthusiastic and friendly staff will be in attendance to help you with any queries that you may have on Koi health matters and Koi diseases. Our stand will include a full range of Koi health products including microscopes, water test meters, medications, topical treatments, swabs and many other interesting items, all at special show prices. Healthy Koi are pleased to announce that they will again be attending the South East Koi Show this year. Reputed to be one of the UK’s top Koi shows, the South East International Show will be held at Parkwood Hall School School, Beechenlea Lane, Swanley, Kent. BR8 8DR on Sunday & Monday, the 29th & 30th August, 2010. The Show, which has an international reputation for excellence, opens to the public from 0930am until 5pm. It will host an exciting range of Koi trade stands and well as an arena full of stunning Koi.In addition to our usual range of items, we will this year be having an extended display of Hanna electronic water testing equipment and accessories. You will have the opportunity to look at the Hanna 83203 multimeter with improved accuracy. In addition to the single and multi-parameter testing equipment & reagents, we will be displaying a range of hand held Hanna dip meters which are both inexpensive and easy to use. To make testing even easier, take time to talk to us about the provision of a ‘Continuous Reading’ meter which have become very popular. During the Show, our enthusiastic and friendly staff will be in attendance on the stand to help you with any queries that you may have on Koi health matters, testing, care, welfare and Koi diseases. Our stand, which will be located in the West Marquee, will include a full range of Koi health products including a new range of top value secondhand serviced microscopes, medications, topical treatments, swabs and many other interesting items, all at special show prices. Due to a family wedding this weekend we would like to let all customers know that the shop will be closed all day Friday 23rd July and Saturday 24th July. We will be open as usual from Sunday 25th July onwards. Following a lengthy consultation exercise and evaluation of the possible benefits and likelihood of success, DEFRA has concluded that an eradication programme will not be undertaken for KHV disease in England and Wales. This means that Category V (infected) status will be assumed immediately for England and Wales. A thorough impact assessment concluded that this is the most pragmatic approach after considering the likelihood of success in trying to eradicate the disease. However, DEFRA will be keeping this decision under review. The adoption of category V status will mean that there will be no changes to the control regime currently in place. Passive surveillance by DEFRA will continue, the disease will remain notifiable and existing control arrangements will stay in place when an outbreak is confirmed. Imports of susceptible species from countries outside the European Union and movements from other Member States will continue in line with the rules that currently apply. However, movements of susceptible species will not be possible from GB to areas of a higher health status in other Member States. The exception being those movements from compartments in GB (e.g. individual farms) which have gained KHV disease free status (category I). Given that the weather has now got warmer and the likelihood of outbreaks of KHV in the ornamental sector is high, we urge everybody to apply the highest possible biosecurity when purchasing new fish or dealing with your existing stock. Should you require any assistance or advice, please do not hesitate to contact us. Volcanic ash is formed during explosive volcanic eruptions. This occurs when gases dissolved in molten rock (magma) expand and escape violently into the air, and also when water is heated by magma and abruptly flashes into steam. The force of the escaping gas violently shatters solid rocks and blasts it into the air, where it solidifies into fragments of volcanic rock and glass. Once in the air, our weather patens take over and wind can blow the tiny ash particles thousands of miles away from the volcano. The components of volcanic ash are mildly corrosive and potentially conductive. The soluble coatings are derived from the interactions in an eruption column may be composed of sulphuric and hydrochloric acid and droplets with absorbed halide salts. At the present time, the prevailing winds are driving the ash from the recently erupted Icelandic volcano south/ south eastwards. Predictions are that the ash fall-out will start to occur in Scotland tomorrow and move further southwards. Although the silica content of the volcanic ash is considered non-toxic, the problem starts when there is a ‘sulphur’ component to the residue. Already, from some of the eyewitness accounts in Scotland, people have commented on the smell of rotten eggs (Hydrogen Sulphide). As the ash moves Southwards further over the UK, it would be prudent for those with pond covers to replace them for a short period. Koikeepers with uncovered ponds should keep a close eye on the fish. The addition of clay to the pond will help to buffer any reduction swings in pH due to the acidic content of the ash. Should any unusual behavior occur with the Koi, a water change using a purifier or the addition of de-chlorinator will help but keep an eye on pond water temperature changes. It is not unusual for problems of this nature to occur. Earlier this year, sulphur dioxide was detected in blood samples we took in the West Country whilst investigating Koi mortality. This occurred after a period of northerly driven snow and rain. If you need any further help, do not hesitate to give us a ring on 01243 572762 or 07726840627. Healthy Koi are pleased to announce that they will again be attending the South Hants Koi Show this year. Reputed to be one of the UK’s top regional Koi shows, the South Hants 19th Open Koi Show will be held again at the Havant Leisure Centre, Civic Centre Road, Havant on Sunday 30th May and Monday 31st May, 2010. The Show, which opens to the public from 10am until 5pm, will host an exciting range of Koi trade stands and craft stalls and will include bonsai & aquarium displays. HAVANT LEISURE CENTRE. CIVIC CENTRE ROAD. This year, we have had a very harsh and severe winter. Unfortunately, some fish, who were in poor condition when they went into the winter, did not survive. Others, who have been weakened by the prolonged cold spell will emerge in the spring with depleted strength and not in the best of health. As a result, it is important that their environment is well looked after, they have excellent water quality and you start feeding again with wheatgerm/ multi-season feeds as soon as the temperature allows. Blood samples taken at this time of year often show the Koi to be anemic. The resumption of feeding will help them with any nutritional problems and to regain their former condition. Moving on now, for Koi keepers, there is a host of work to be carried out at this time of year. There is a need to prepare for the warmer weather with increased activity of our Koi and our pond ecosystem. Time spent now will reap large rewards later in the season. The last thing you (or your Koi) want is an equipment breakdown in mid- summer when you are away on your holiday and the neighbour is doing his best to look after your treasured Koi. If you need any advice or have any concerns, do not hesitate to contact us at any time. During the past few weeks, the enquiries we are getting have changed from the usual warm weather bacterial/ parasitic/ water borne problems to low temperature related difficulties. This week, we have encountered a Koi on its side in an above ground vat at Southampton (water temp 2.2deg.C. ), visited Milton Keynes with a similar Koi on its side in a shallow pond (water temp measured at 1.0 deg.C) and as we write this article, we are dealing with a 24” ‘sided Koi’ in Cheshire – again almost sub-zero pond water temperatures. Despite what you may have read, once the water temperature gets below 2- 3 deg.C., your Koi are at risk. At this temperature, all the life giving functions have slowed right down and survival is a challenge to any Koi who is not in a good healthy condition. One major problem which often occurs is chilling of the swim bladder which impairs the buoyancy of the Koi. The only way to correct this is to warm up the pond water slowly, if possible or alternatively, transfer the affected fish to a warmer environment (i.e. quarantine tank). If the Koi is left on its side, it will deteriorate and often, fungus takes hold. 1. If fish are on their side, undertake a 25% water change. Your tap water will be in the region of 8- 9 deg.C. at the present time. Remember to use a purifier or de-chlorinator. Put in a small heater (if the energy costs are affordable!). Turn down the air but make sure you leave a reasonable amount in your pond. There is still an oxygen demand in the winter by your Koi, filters and system. Cover the pond to reduce heat losses but make sure that you leave an air gap of at least 4” and ventilate under the cover. Should the surface freeze, melt a hole in the ice. Do not smash a hole through the surface. If you are not sure what to do, give us a call and ask for advice. We are only a ‘telephone call’ away. If you do not have an accurate digital thermometer, we have many inexpensive ones here that we can send you one. Good luck with the winter.